Cut the chicken into chunks. Place in a food processor and briefly process until finely chopped. Add the sake, egg whites, cornflour and salt. Process in short bursts to form a thick paste. This can take a few minutes. Heat the oil in a deep fat fryer or heavy, deep saucepan to 160°C (or when a cube of bread turns golden brown in about 40 seconds). Using teaspoons, shape some of the paste into small balls and slip into the hot oil. After a few seconds, dislodge them from the bottom, and as they float up, flip them over. They will take 2-3 minutes to cook. They are cooked when pale gold and fairly firm. Check by cutting one open. Remove and drain on kitchen paper. Repeat the process until the paste is finished. Set aside, or cool and chill until needed. Pour 400ml stock into a pan, and the rest into another. Bring both to the boil. 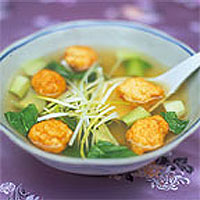 Drop the chicken balls into the 400ml stock, cover and simmer until hot. Divide the balls between 6 bowls. Leave the stock in the pan. Return to the boil and drop in the pak choi. As soon as it wilts, remove and divide between the bowls. Add the spring onion, then ladle in the clear stock from the other pan. Serve immediately.